It is not entirely clear when the Duke of Clarence Yard was built, certainly it does not appear on Bidder's map of Yeovil of 1843 but it is present on Hickes & Isaac's map of 1858. It was a cul-de-sac entered alongside the Duke of Clarence public house, off Stars Lane, with a terrace of eight 'two-up-two-down' houses running the length of the yard on its south-eastern side. As seen on the map below, the land behind the rear gardens of the houses was an orchard. Indeed Bidder's map of 1843 shows stars Lane almost completely surrounded by orchards and just one or two houses, including Stars Lane House, being shown. The land shown as orchard on the map below was, within ten years, built on with Talbot Street. By 1900 Duke of Clarence Yard had became known as Clarence Terrace. It was (I believe) demolished in the late 1960s. 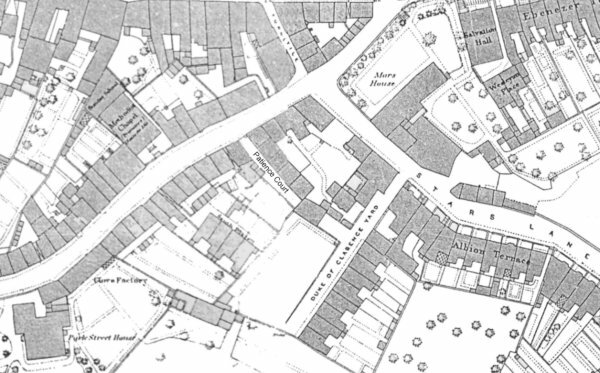 The 1886 Ordnance Survey shows the cul-de-sac Duke of Clarence Yard at centre, entered off Stars Lane. 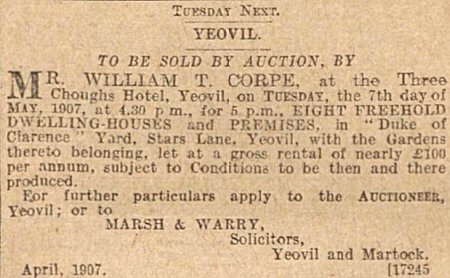 This notice of sale for all eight dwellings in Duke of Clarence Yard is from the Western Gazette's edition of 3 May 1907. A 1928 aerial view of Stars Lane with Duke of Clarence Yard. 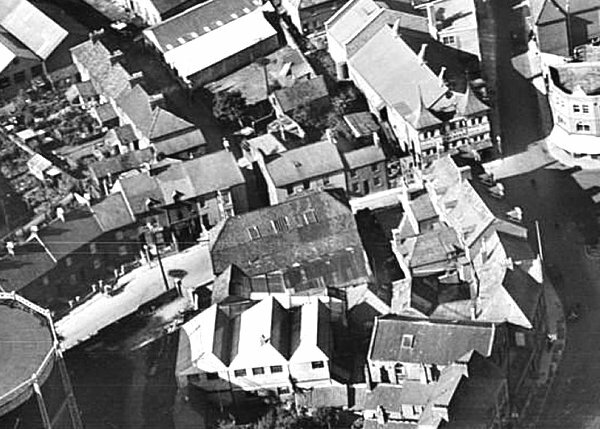 To the right, the large building is the old Palace Theatre - Yeovil's first cinema - on the corner of Stars Lane and South Streetthe Duke of Clarence (slightly masked, but seen as two separate buildings at centre).To the left of the Duke of Clarence and running to the top left of the photo are seen the houses in . At extreme right is the Triangle. Note also the large gasometer at bottom left. .... and seen from a different angle in 1953. 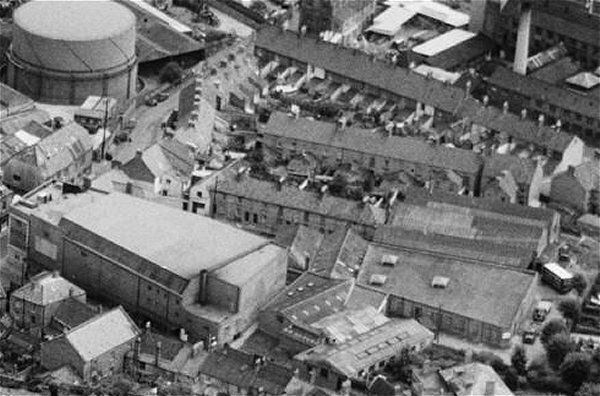 At top left is the gasometer adjacent to Stars Lane and at bottom left is the Gaumont Cinema. Duke of Clarence Yard is at the centre of the picture above and right of the Gaumont. Further up are the backs of the houses in Talbot Street and further still the backs of the houses in Summerhouse Terrace.